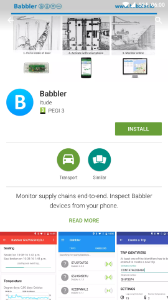 Babbler devices. Contact us to buy some. ​A link to your personalised dashboard. You receive this by email when you buy babblers. Note: Attach the Babbler to the inside of the container door, close to the rubber. When only used for temperature, place it with the cargo. Note: You do not have to be in the vicinity of a Babbler to end a trip. If you have not yet logged in, go to settings and sign in with your username and password. Open the app and create a new trip. 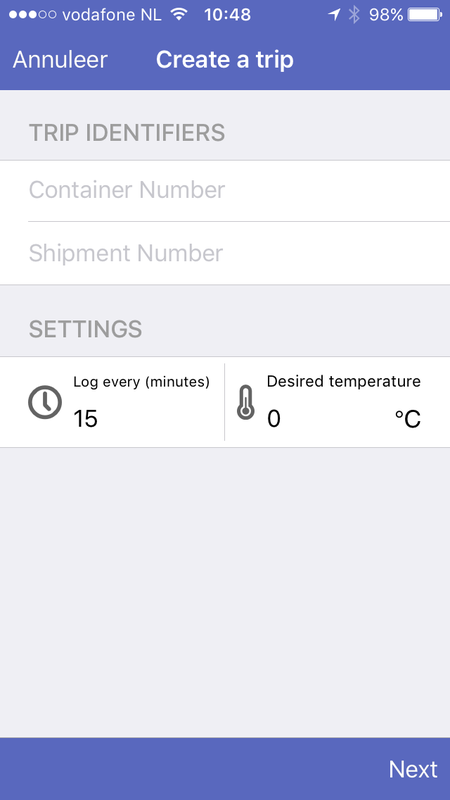 Fill in either container number and/or shipment number. 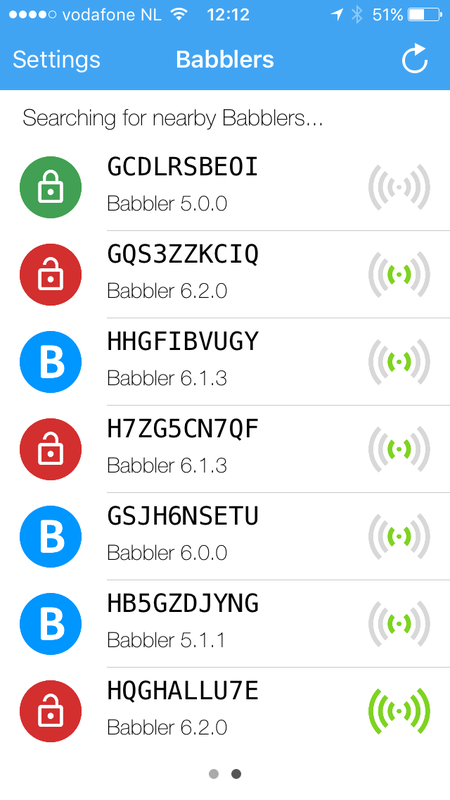 Select the Babbler(s). The device number is visible under the transparent case. Create the trip. 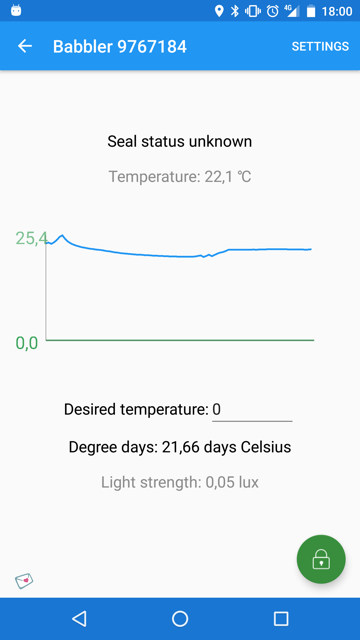 When used for temperature, fill in “desired temperature”. Log interval is set at 15 minutes, when you require another interval, change "log interval". From this moment on, data is going to be logged for this trip. Attach the Babbler to the inside of the container door, close to the rubber. When only used for temperature, place it with the cargo. 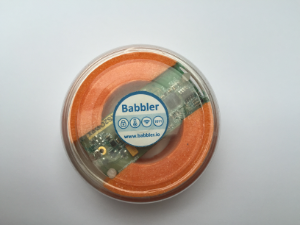 After closing the container doors, activate the Babbler to seal by pushing the button ”seal”. When it turns out that there is more light in the container than expected, you will get a warning. At the bottom of the screen you see the current light strength. Then go to settings and change within “Sealing service” the “maximum Lux threshold”-value to the required value. Push “Done” and seal the Babbler. Whenever possible, get someone to open the app while standing in front of the container door. The data of the Babbler is shown in the app and sent to the dashboard. 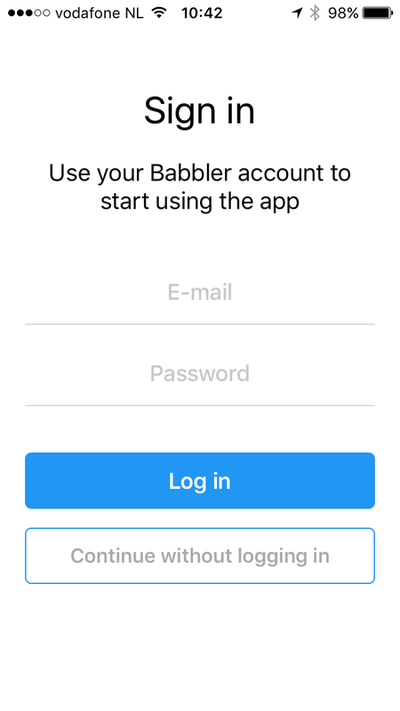 Either go to Trips, select the trip, select the babbler. Or go to Babblers, select the babbler which is/are nearby. When you see the list of Babblers, seal status is sent. 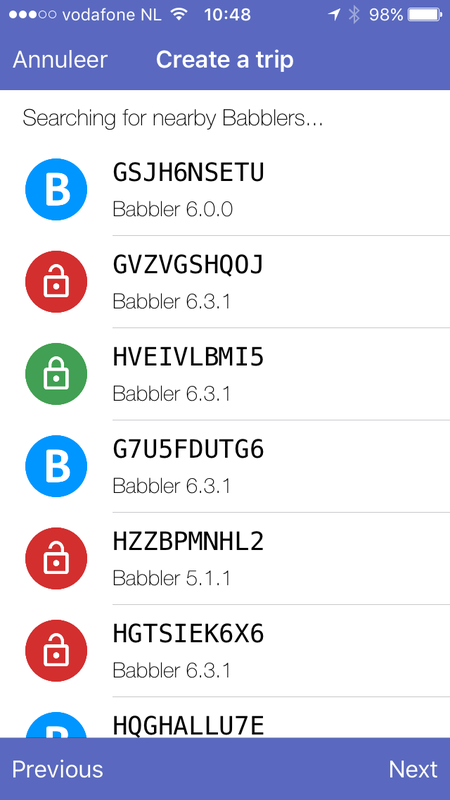 When you select a babbler, all logs are sent. 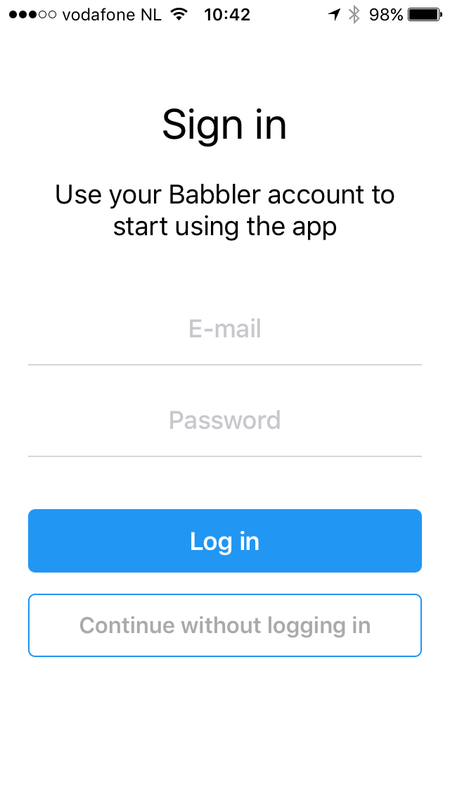 The user does not have to sign-in to see the babbler-screen. Whenever the Babbler seal is broken as expected, seal again. Whenever the Babbler seal is unexpectedly broken, open the container and check carefully. After that seal again. 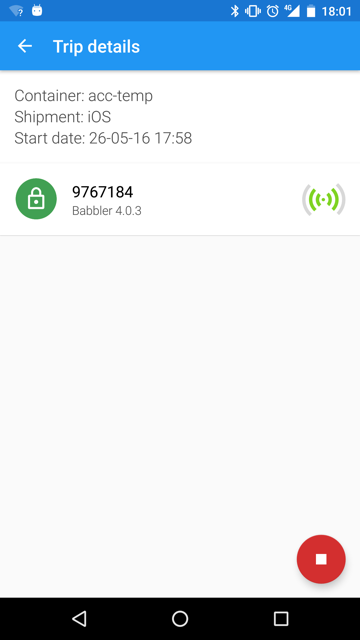 If babbler has LoRa-functionality, within the Netherlands, current status is visible at the dashboard without human intervention. 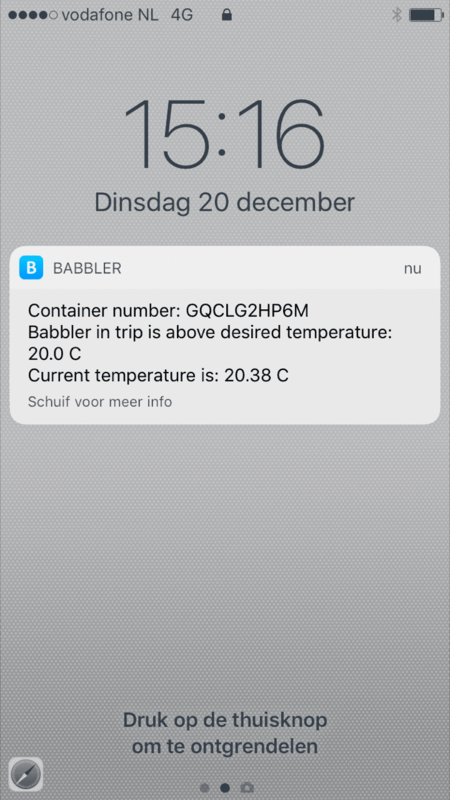 Before ending a trip, first make sure all data is uploaded by going to the babbler details screen and upload temperature and sealing log. 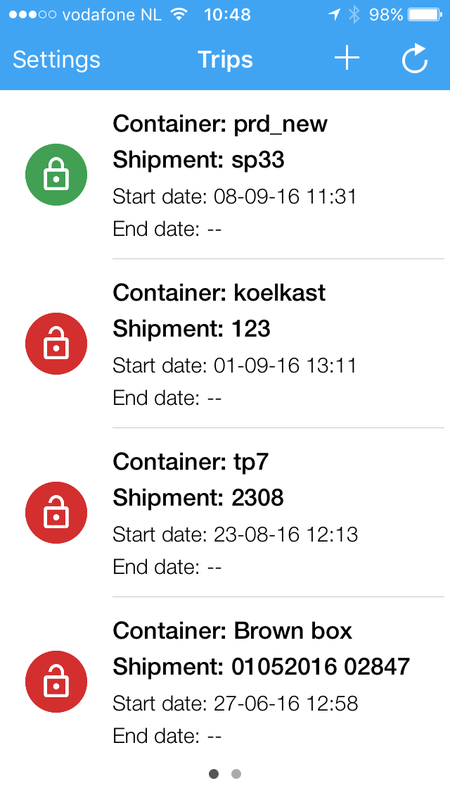 When the shipment is finished, end the trip by selecting the trip and press “end trip” (android “red stop button"). Data logged from this moment onwards is no longer linked to the selected trip. When you select the babbler, via the trips-screen, the end date of the graph is the enddate of the trip. When you view the babbler from the babbler-screen, the end date of the graph is the current date. 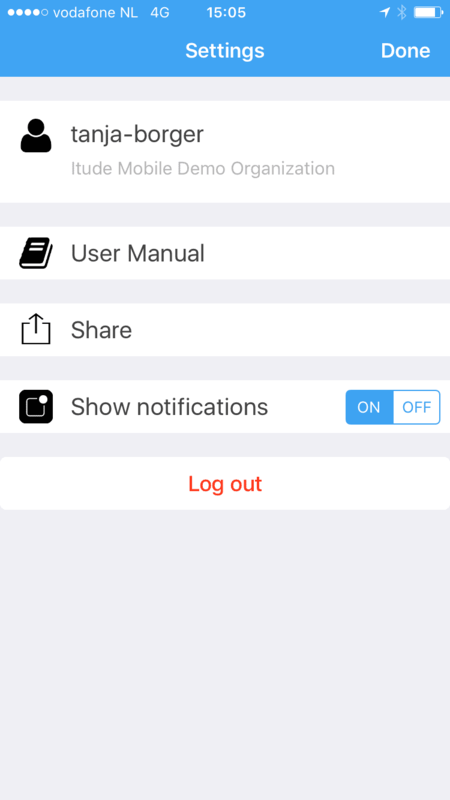 Go to settings screen and turn on "show notifications". As soon as the measured temperature is above the desired temperature you will get a notification. 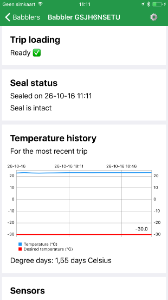 The notification shows trip details and the current temperature. You have to request this option for your organization. 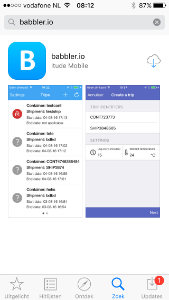 Moist cargo may block the signal signal to your smartphone. Install the Babbler next to the door rubbers. Alternatively, you can opt for our LoRa Babbler device which is less affected by water content in cargo. The battery may be empty. The expected battery life is 14 months. Return the device and we will provide a new one with fresh battery. Alternatively, unscrew the lid and replace the battery (see below). Location has to be turned on. Bluetooth has to be turned on. This may be due to the fact that babbler uses European notation and csv output is American notation. For extended battery life, use a Panasonic CR 2450 coin cell. 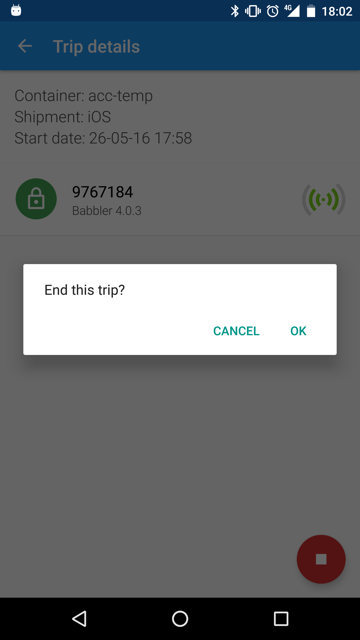 After replacing the battery, end the "old" trip and create a new trip so that data can be linked to the trip. If you cannot find the app on Google Play or Apple's App store, look for the logo and description shown here.